Soak, Scrub and Soothe away tension and muscle pain with our therapeutic organic spa products, all in the comfort of home! 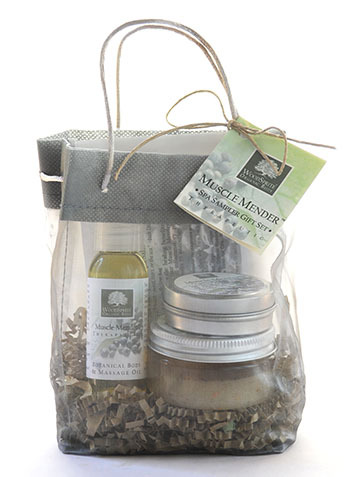 Our handmade Spa Sampler Gift Tote features four products from our popular Muscle Mender line. Perfect for the active athlete or for men; not only does Muscle Mender smell refreshing, but with its organic arnica, turmeric, juniper and comfrey, it actually works, too! Gift Set Contains: 4 oz. Spa Salts Packet, 2 oz. Sea Salt Scrub, 1 oz. 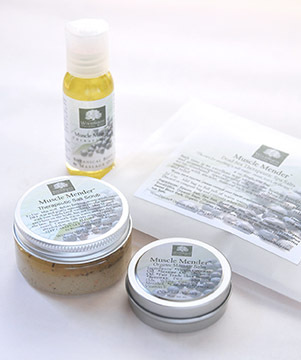 Organic Massage & Body Oil and .75 oz Organic Massage Balm. Reusable Organza Handled Tote, with recycled paper fill and hand-tied tag.